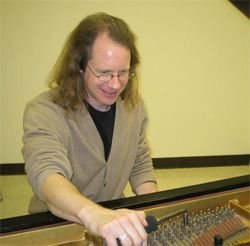 Jeffrey Johnson is currently Professor of Music at the University of Bridgeport in Connecticut. An active journalist and writer, he is the classical music and opera critic for the Hartford Courant, and has written for the Boston Globe, The Stamford Advocate, and The Greenwich Time. He writes for and maintains the classical music blog called SonicLabyrinth. He has published four acclaimed books on music theory and performance practice with Greenwood Press and Dover Publications. His latest publication, which is his first specifically designed for digital media is called “Hearing Inside Handel’s Messiah,” and is available on Amazon.com. Jeffrey hosts the Opera in Cinema Series at the Bijou Theatre in Bridgeport, and is a frequent lecturer at The Quick Center prior to Met Live-in-HD screenings. He writes program notes for The Greater Bridgeport Symphony and is a frequent pre-concert lecturer. He has degrees in musical composition from Boston University, Eastman School of Music, and Ithaca College. Join Jeffrey on air Sundays from 9:00 to noon.